I am planning to get my first cockatiel this weekend, and I am very excited, so I just wanted to share! I have owned many budgies, and I think I’m finally ready to try a larger bird. In a small apartment, a cockatiel seems the logical choice, especially since they are supposed to get along fairly well with budgies and have similar care. I hope I am able to bond with this new species, and that she and my budgies get along. Below is my new cage, all set up for quarantine. 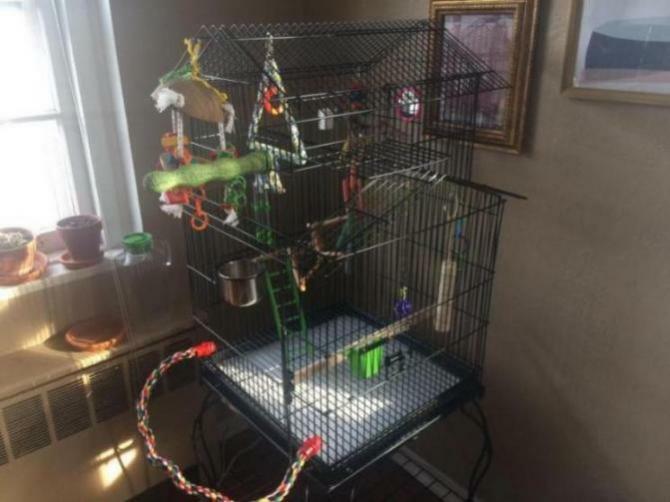 I am happy with it as a starter cage for one cockatiel. It’s dimensions are 23.2 x 23.2 x 54.9’’ with the stand, and it’s the perfect size for our apartment. However, I would definitely like to go bigger if we end up getting a larger home. Set-up’s still temporary as I look for a much larger ladder or drawbridge to hang from the back of the cage, rather than the small green one. I hid a piece of millet in the purple ball for foraging. Last edited by FaeryBee; 03-29-2019 at 08:20 PM. Be sure you quarantine the new bird. Quarantine means housing the new bird in a different cage in a different room than the current bird (as far away from the room the current birds are in as possible) for a period of 35-45 days. Birds mask symptoms when they are ill. Symptoms may not show up for over two weeks. Often you will not even realize your bird is not well. Many avian illnesses are airborne which is why you need to quarantine your new bird in a completely different room. It is also a good idea to always take a new bird in to see an Avian Vet for a "well-birdie" check-up. This allows you to develop a good relationship with the vet and the vet can establish a baseline for your bird in case of any future illnesses or injuries. After quarantine, when you introduce your cockatiel to your budgies, make sure you supervise them very closely. As a rule of thumb, I do not include any two of the same perch in a cage to avoid pressure sores. 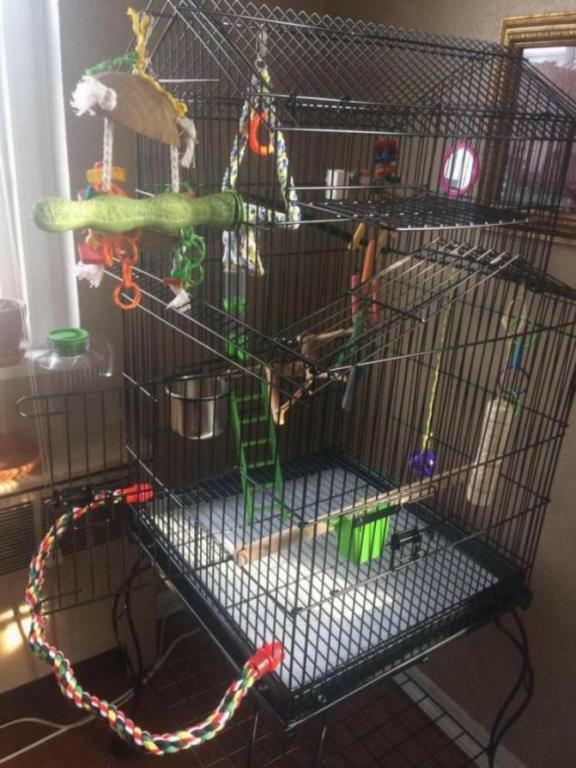 I personally don't mind the idea of having one wooden dowel perch in addition to other options, but thank you for continuously educating budgie owners on best practices! I learned so much from you and others years ago when I joined this site. Personally, I also find it important to have variety of types of perch materials to help with their grooming needs. I recently replaced a wooden dowel perch in my budgie's cage that they had chewed almost halfway through over several years. They do not seem to enjoy chewing on the harder wood perches as much. It's difficult to see in this picture, but I also have two types of natural wood perches and a sturdy rope swing in addition to the dowel and plan to include a wood ladder or drawbridge for more perching variety as well as plenty of out-of-cage time surfaces. I just successfully convinced my significant other of the importance of quarantine and he picked our living room as the quarantine site. I agree that the types of perch materials is important as well. Good for you in convincing your S.O. of the importance of quarantine!! Your babies are fortunate to have you caring for them!